The group show organized as a result of one year of activity of the Trankat residency in Tétouan, tours through 7 Moroccan cities in 2014. Information and photos. 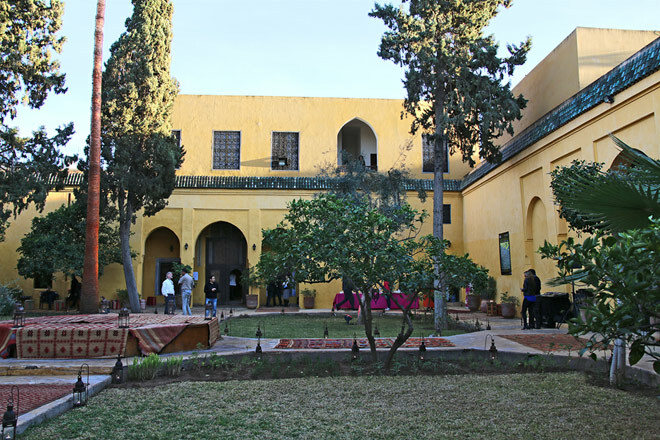 The itinerant exhibition Trankat, Episode #1 is the fruit of the first year of activity of Trankat, an artistic residency co-founded by Younès Rahmoun and Bérénice Saliou, located in a patrimonial house of the medina of Tétouan in the North of Morocco. Touring through seven Moroccan cities in 2014, Trankat Episode #1 displays video works and installations created by Jordi Colomer, Fouad Bouchoucha, and Moussa Sarr, during their residence in 2013, inspired by the context of Tétouan and its magnificent medina, in connection with the work of local craftsmen and the art schools of the city. These projects are set into dialogue with the works of Moroccan artists Simohammed Fettaka, Mohssin Harraki and Youssef El Yedidi. Jordi Colomer presents two videos which explore Tétouan according to architectural, sociological and poetic approaches. One of them, entitled Architects (Tétouan) , is the result of an eight-day workshop with students of the National School of Architecture of Tétouan, during which the students guided the artist through the city. Fouad Bouchoucha chose to confront the incessant disappearance of craftsmanship and the development of the industry by reinterpreting the zellige (traditional ceramics) in an installation called The Mistress and her Slave. As for Moussa Sarr, he dealt with cultural and identity clichés by producing a drone-like flying carpet, and a video entitled The Call, during which the roosters of the medina answer the artist's calls. Echoing Fouad Bouchoucha’s work, Simohammed Fettaka questions with his video Creatruction the rejection of a life in rural areas for the benefit of an eventful urban existence. Mohssin Harraki proposes a new version of his work Aquariums, composed of history books of Morocco in Amazigh, Arab and French, whose pages gradually dilute and disappear at the bottom of three water tanks. Youssef El Yedidi, a promising self-taught artist, still little known by the Moroccan art scene, revisits the Strait of Gibraltar as a negotiating zone, with an installation created specifically for the occasion, from what he calls "urban debris of Tétouan". Finally, Kader Attia shows Couscous Aftermaths (3000 years old movement) , a touching video underlining the inevitable character of the passing time and the persistence of popular beliefs. Bringing his support to Trankat and his friend Younès Rahmoun, he is part of the show as an honor guest. Curated by Bérénice Saliou, the event is produced by the French Institute of Morocco. A Book-DVD, realized by Gilles Coudert, accompanies the project, co-produced by Après Editions. The group show organized as a result of one year of activity of the Trankat residency in Tétouan, tours through 7 Moroccan cities in 2014. About the new art space launched in Tétouan, Northern Morocco. Artists in residence, exhibitions and education program. Trankat residency artists at La Valette-du-Var, 16 Sept. - 25 Oct. 2014, curated by Bérénice Saliou. Panel: Artistic Emergences and Mobility in the Mediterranean Area, 16 Sept. in Marseille.